As we approach Christmas, Donald Macleod explores Rimsky-Korsakov’s religious beliefs and the links between folk music and religion in the life and work of the professed atheist. Donald Macleod delves into the life and work of one of the most important Russian composers of his age – Nikolai Rimsky-Korsakov. 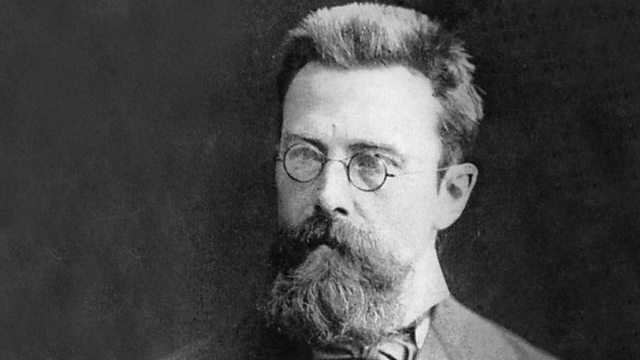 Rimsky-Korsakov’s music is filled with lush orchestration and hints of orientalism and folk music. These elements and his role as a leading member of “The Mighty Handful” of composers who sought to forge a truly nationalistic music has led him to be regarded as the main architect of the Russian style of composition we know today. Rimsky-Korsakov professed to be an atheist, but wrote some sacred music for the Imperial Court Chapel. In Thursday’s programme, Donald explores this claim, and the intriguing links between folk music and religion in the life and music of the man who Stravinsky famously said was "closed to any religious or metaphysical idea". Performer: Sergey Rybin. Singer: Yuriy Yurchuk. Singer: Anna Netrebko. Singer: Vladimir Moroz. Singer: Dmitry Voropaev. Director: Nikolai Korniev. Orchestra: Mariinsky Orchestra. Conductor: Valery Gergiev. Performer: USSR State Academic Symphony Orchestra. Conductor: Evgeny Fyodorovich Svetlanov. Choir: Cappella Romana. Conductor: Alexander Lingas.